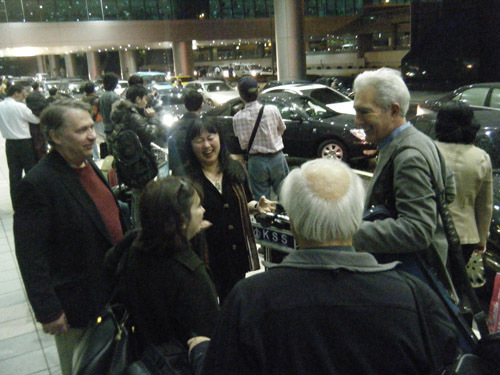 Boarding a flight in the wee hours of the morning, after participating in the final Chamber Music Society performance of the Brandenburg Concertos of the season, Wu Han and David headed for Wu Han’s home country of Taiwan, at the invitation of the National Concert Hall, to inaugurate the first of three annual chamber music courses in Taipei. 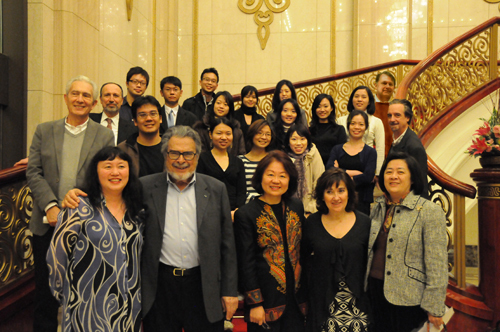 Motivated by their vivid memories of the Isaac Stern Chamber Music Encounters in Jerusalem, Carnegie Hall, and other cities around the world, David and Wu Han, along with many former Stern faculty members, have long dreamed to reincarnate the unparalleled experience of chamber music study they shared. 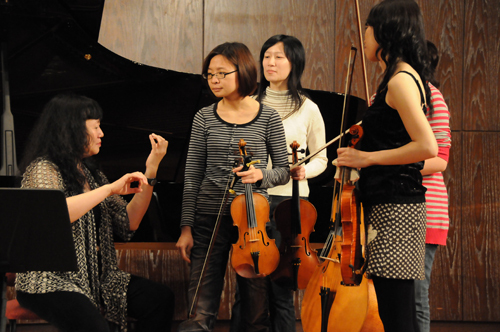 Discontinued after Isaac Stern’s death in 2001, his workshops – in which young ensembles were coached for up to two weeks by teams of distinguished faculty – remain for the past participants unforgettable, transformative experiences. 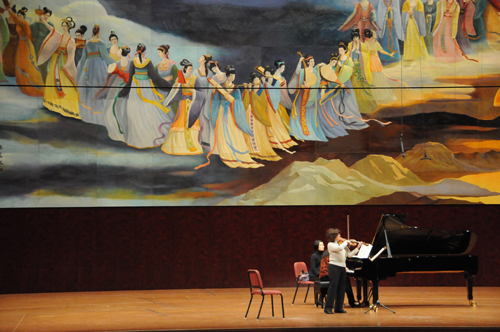 When the director of the National Concert Hall approached Wu Han with the desire to bring the finest chamber music coaching to Taiwan, David and Wu Han realized the opportunity to continue and build upon the model of the Stern workshops was within their grasp. Administrating the workshop as a program of the Chamber Music Society of Lincoln Center gave the project an immediate and distinguished artistic identity, and the artists chosen for this year are all stellar musicians as well as many veterans of the Stern workshops: pianist Leon Fleisher, violinists Ani Kavafian, Arnold Steinhardt and Philip Setzer, and Juilliard School dean Ara Guzelimian as lecturer, in addition to David and Wu Han. Soon to follow are David Finckel’s reports on this exciting project, which will of course include photos plus musical anecdotes and more. Having left home at 4am, flown from New York to Los Angeles, changed planes, Los Angeles to Tokyo, changed planes, and Tokyo to Taipei, we arrive with Phil in tow. Ani and Arnold arrive in the immigration line just behind us, having flown a different route, and Ani’s husband Bernie appears as well, having flown yet another route. Arnold’s silvery head is no problem to pick out of a crowd here, and we were spotted immediately by organizer Wei-Ling, who exchanged over four-hundred-fifty e-mails with CMS Director of Artistic Programs Michael Lawrence to make this all a reality. We are off to the Taipei Four Seasons Hotel, some food, and hopefully a good night’s sleep. 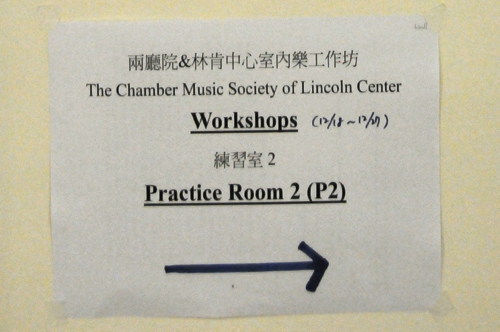 After a lavish breakfast buffet of Chinese and Western food, we depart at 9 for auditions. The National Concert Hall, our host for the project’s concerts and teaching, is a monumental venue which is part of one of Asia’s first major performing arts centers. We decided it would be wise to hear each of the ensembles run through their repertoire before actually coaching, as we will have the opportunity to discuss our impressions of their needs and the kind of paces we should put them through. 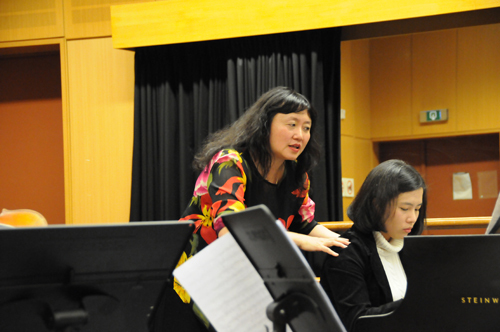 Before the auditions, Wu Han described to the faculty the genesis of the project, in the presence of National Concert Hall director Ms. Liu. 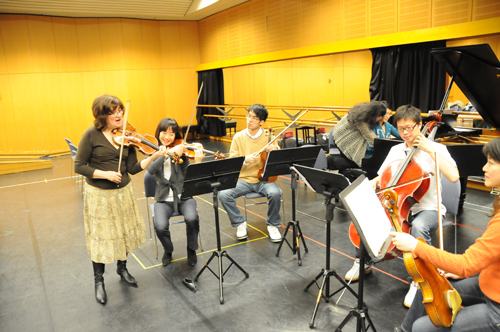 The students all played well, having rehearsed together for three days. 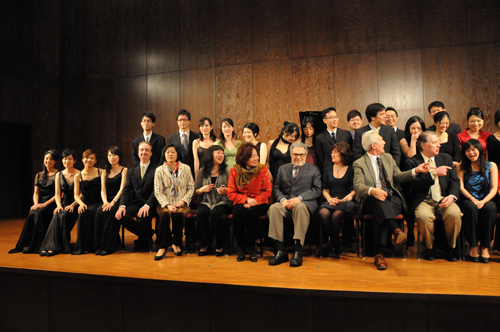 The ensembles were assembled, and the repertoire selected, by us after extensive viewing of their audition videotapes. We look forward to beginning our work with them tomorrow. 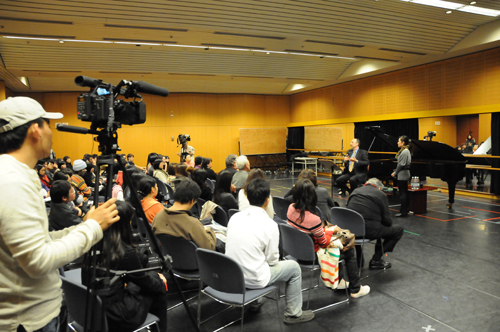 Next order of business was the obligatory Taiwanese press conference, always well-attended by curious reporters. Wu Han and I were introduced by Ms. Liu, and Wu Han described the project in detail. 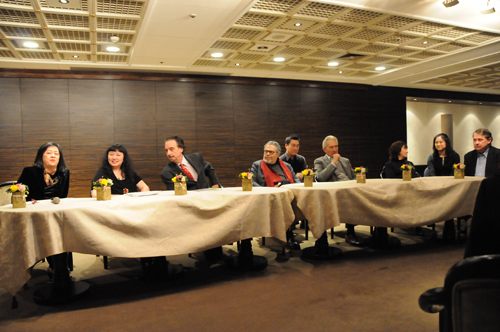 Then she introduced each of the faculty, who made personal statements on their interest in chamber music and music and life in general. 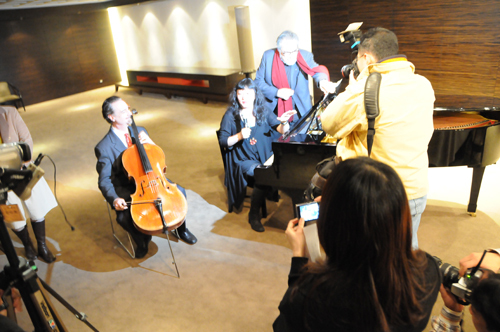 After the interviews, Wu Han and I played the scherzo of the Shostakovich sonata while photographers climbed all over us, flashing away. Leon turned pages, amazed. A commemorative platter, yet to be fired, was signed by all of us, Wu Han teaching us how to hold and paint with Chinese brushes. 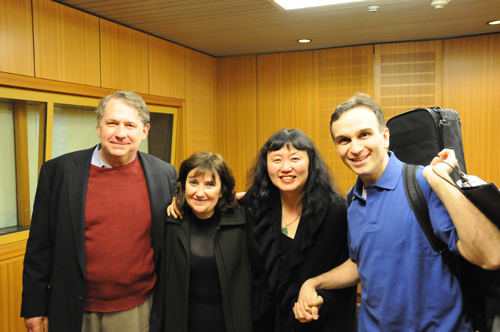 Before leaving, we ran into violinist Gil Shaham arriving at the hall for a concert with the Sejong Soloists. The faculty rehearsals for our Monday concert have been times of great joy and inspiration, as many of us have never played together, although we have admired each others’ artistry for years. 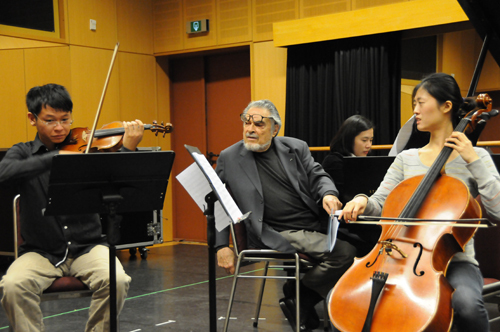 Imagine the thrill for Phil and me to play the Brahms Quintet led by Arnold Steinhardt, one of our idols as we formed the Emerson Quartet, and to do so with one of the greatest pianists of all time, Leon Fleisher. 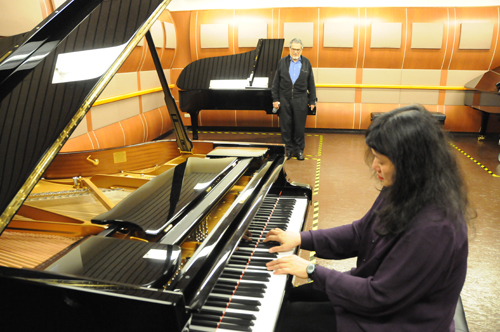 After our rehearsal it was time for Wu Han and Leon to choose the concert piano from among the many fine instruments owned by the Chiang Kai-shek Cultural Center. 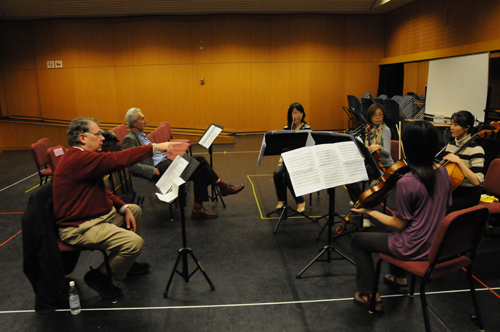 …and the team teaching-format which we found so inspiring during the Isaac Stern chamber music workshops. 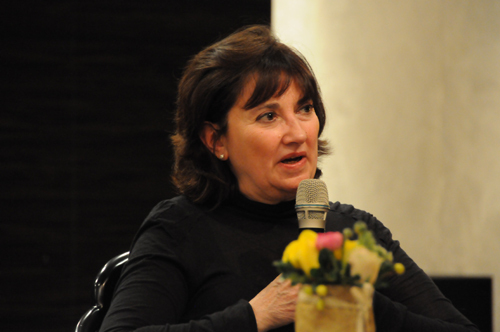 The afternoon also included the first of two lectures by Juilliard School dean Ara Guzelimian, who has made the journey to speak to on chamber music, its history and the art of interpretation. 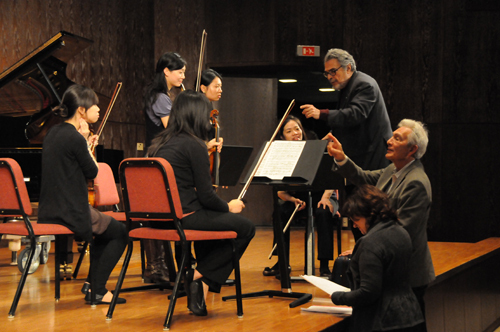 Ara, whose unique combination of musical erudition, professional experience and deep musical passion have made him an irreplaceable component of many of our projects, spoke of chamber music’s place in history, and of the great soloists (like Stern) who have embraced chamber music and who believe it is the best way to learn the art. 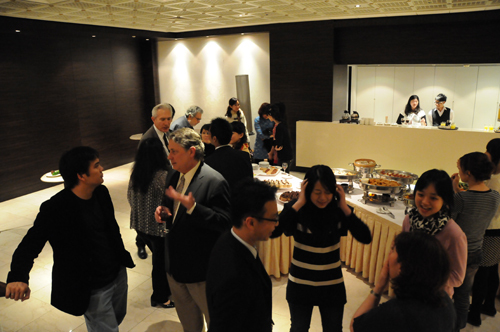 A tradition brought from our Isaac Stern workshop experiences is the happy hour faculty meeting where, over drinks and snacks, we discuss the day’s coachings and assess the needs of each group, Wu Han customizing the schedule daily to ensure even more productive learning experiences for the students. Monday was reserved exclusively for our preparation for the evening’s faculty concert in the very large National Concert Hall. 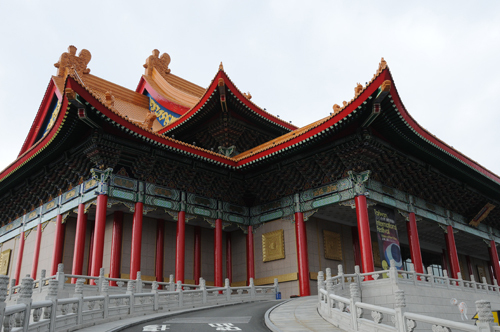 The Concert Hall, completed along its sister building, the National Theater, was opened in 1987 and is part of the complex known as the National Chiang Kai-shek Cultural Center. The ornate venues flank a grand open space in which performances can be shown on giant screens to thousands of overflow listeners. 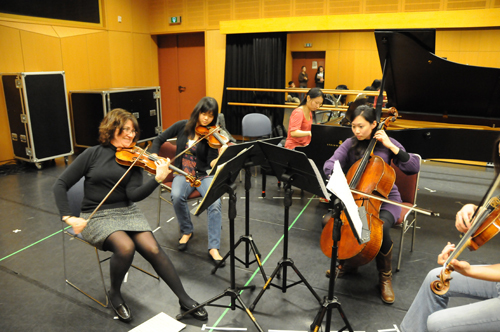 The Concert Hall’s spacious acoustics required assisted rehearsal – musicians helping each other with suggestions of balance, tempi, articulation, dynamics etc. in order to project the intimate chamber works properly into such a large space. 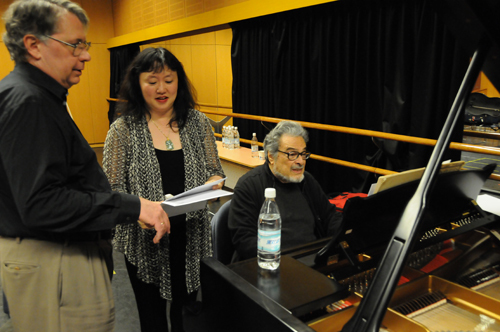 Leon Fleisher and I listened to Ani Kavafian and Wu Han’s run through of the Schubert A major sonata. 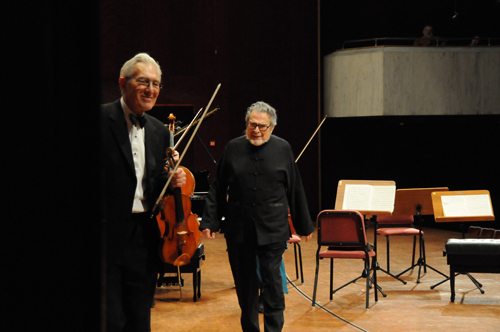 Arnold Steinhardt and Ani listened to me, Wu Han and Phil Setzer run through the Shostakovich Trio. 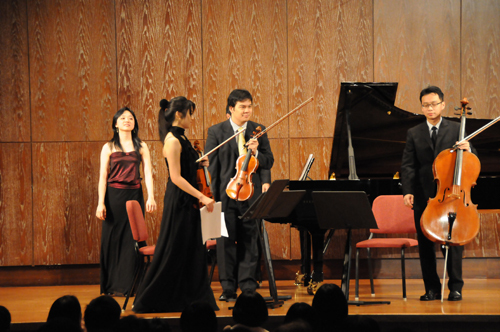 And Wu Han finally helped the Brahms Piano Quintet – with Ani playing viola – get ready for the evening’s eager audience. By the end of the rehearsal, guest lecturer Ara Guzelimian had joined us for a final listening and a faculty portrait on stage. 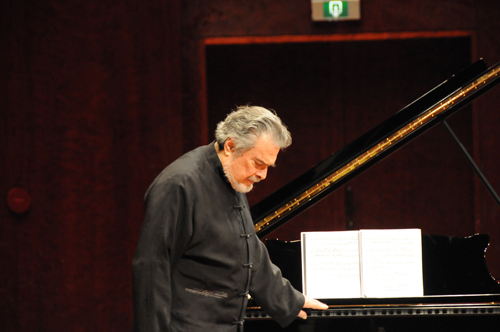 The concert went off without a hitch and we persuaded Leon Fleisher to play a solo encore after the Brahms. His return to the stage alone produced a deafening roar from the already-enthusiastic crowd which clearly affected Leon deeply. He responded with a profoundly beautiful, peaceful performance of Bach’s “Sheep May Safely Graze” (in the arrangement by Egon Petri) which had the rest of us huddled by the stage entrance, transfixed, as was every person in the hall. 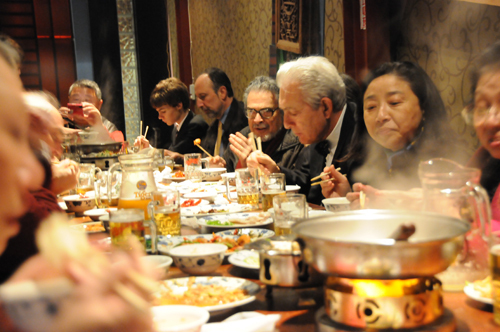 …the ever-hungry musicians were treated to another incredibly delicious late-night Chinese meal. The time has flown by as days of complete absorption in music have meshed into a kind of continuum. 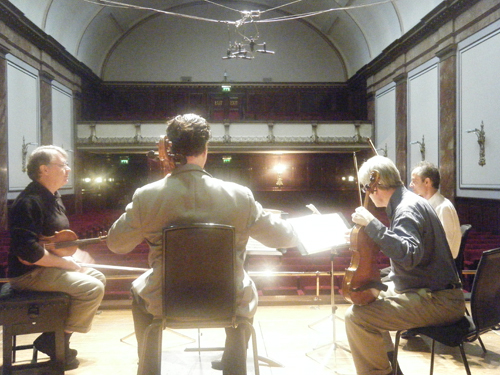 The works we have been coaching – Beethoven Quartet in c minor, Beethoven Trio in c minor, Brahms Piano Quartet in c minor, Dvorak Quintet, Schumann Quintet and Brahms Violin Sonata in A major- are in our ears and heads day and night. I am waking in the night thinking of different ways of explaining the music, of illustrating ever more clearly the points I, or any of us, are trying to make. The students are responding in kind, listening to each others’ coachings, bringing recording devices into the lessons, and asking us for individual help with everything from fingerings to pedaling and sharpening endpins. Tuesday afternoon brought the second lecture by Juilliard dean Ara Guzelimian, who delivered an amazing talk on the art of interpretation. 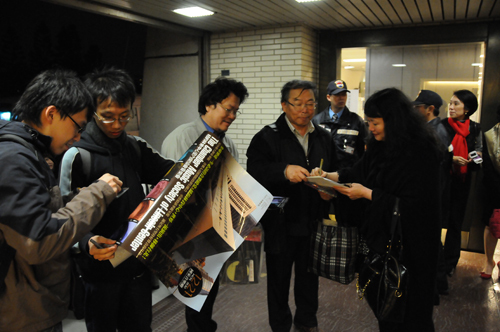 The overflow crowd was accommodated in the lobby of the Concert Hall. Using recordings from the distant past, he clearly illustrated that interpretation of any work is a completely subjective process which can change with generations and performers. His point for us, and for a large crowd of guest music students and teachers, was that there is no one right way to play a piece, and that we must all find our own truths, speaking in a musical language which resonates with us and in our own time. We are so grateful to Ara for making the journey, not only to give his incomparable lectures, but to participate in the coachings and offer his valuable insights. We all felt a loss when he and his son Alec departed for home on Wednesday. The lobby’s grand staircase provided an ideal platform for our first group photo. 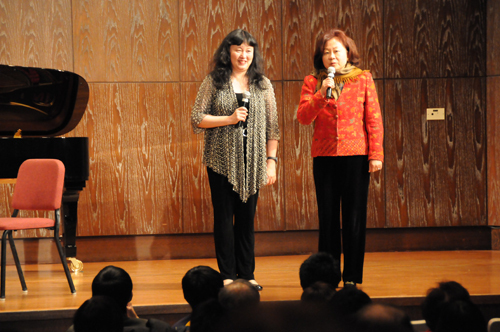 In the front row are Madames Tchen (left) and Liu, who are directors of the Concert Hall. 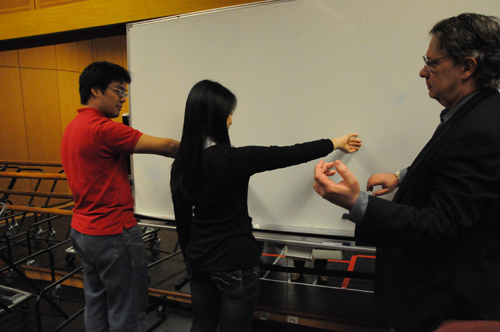 Among the coachings later in the week, Phil Setzer squeezed in a special class in sound production. 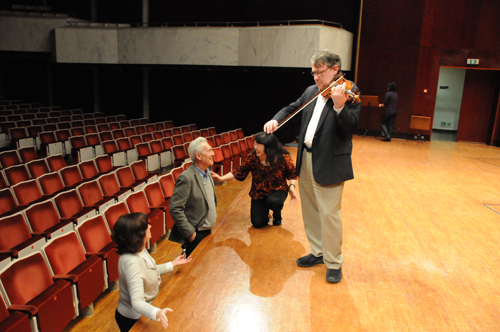 Assembling all the string players, he demonstrated the various stages of extracting resonance from the violin: first, using little bow and no pressure, he made a sound that was more like the scraping of a chair on the floor. Then, by applying bow speed only, the string itself began to vibrate. 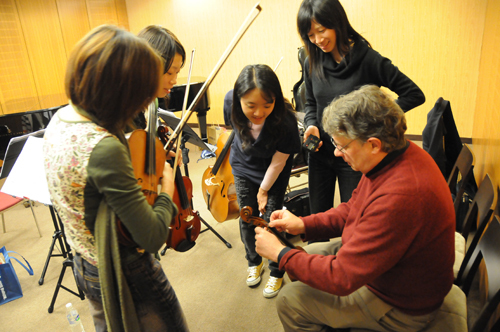 Moving the bow closer to the bridge, Phil asked the students to sense that the top plate of the instrument was beginning to vibrate, and then, gradually applying bow pressure, to try to reach all the way through the violin to engage the back of the instrument as well. By this time, the sound had grown round and full, and once he had gotten the instrument in a true resonating mode, he began to apply a modest, regular vibrato, and the sound was truly beautiful. 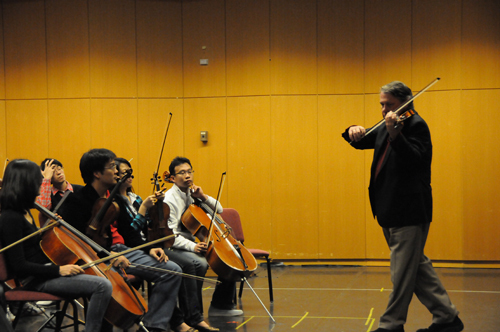 To show off his method, he performed the same procedure with several of the students’ instruments, including a viola with complete success, and instructed several players as they tried it themselves. 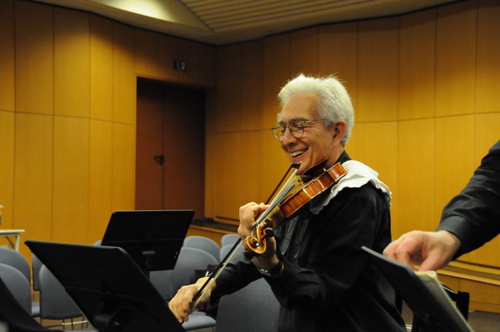 In addition to the sound production technique, Phil also passed along the bow-changing technique taught to him by his mentor Oscar Shumsky. Students were asked to imagine their hands as paint brushes, and to move their hands, first up and down, and then from side to side, against a wall, as though painting. The point is that when painting in smooth strokes, the arm changes direction just before the brush bristles flip, creating a seamless directional transition during which motion never stops. As applied to the violin, the brush handle becomes the wrist and hand, the bristles become the fingers, and the arm makes the same motion, changing direction while flexible fingers and wrist allow the bow to follow the arm slightly later, and without a break in sound. 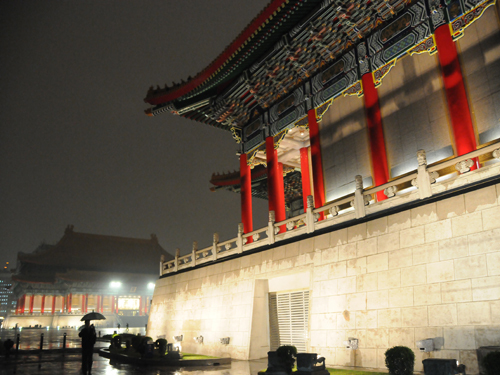 During a late night meal, an earthquake of 4.5 magnitude shook Taipei for a good 20 seconds. The epicenter was off the east coast, far from us, but was felt throughout Taiwan. I was not fast enough with a video, which would have showed the lamps swinging, but I did catch Wu Han excitedly explaining that we should not worry as long as the floor is moving from side to side, rather than up and down, at which point we should dive under the table. 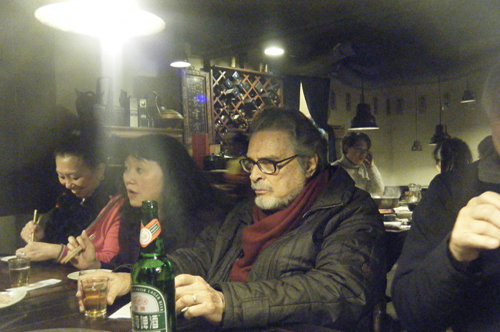 People made quick phone calls, Wu Han’s sister Evelyne thought it was all very funny, and Leon Fleisher gripped his beer, probably thinking it was his last. Friday was a day of opportunity for us all, as the ensembles were able to run through their pieces for the first time in the concert hall. It is a smaller hall than where we played, but in the same building, and is a beautiful space and the perfect size for chamber music. Under a time constraint, the groups were just able to play through without comments, although at the end, the faculty descended upon the last group in a kind of coaching frenzy the likes of which I haven’t seen. 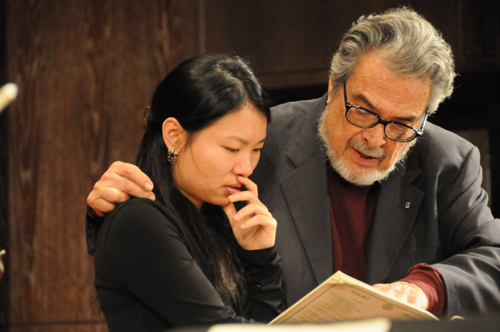 Leon Fleisher, ever supportive, dedicated and demanding, offered advice to Schumann quintet pianist Wen-Chi Fan. As the students near their performances tomorrow, which are the culmination of this workshop, it seems in many ways that our work with them has only begun. The works we chose for these groups is a collection of some of the greatest masterpieces of chamber music, and as all professional musicians know, our work on them is never really finished. I’m sure I speak for the entire faculty when I say how desperately we hope that they have learned from us, that they will feel good about their performances, and that we have given them something they can take with them on their musical journey forward. As the project nears its end, there is a sudden crescendo of emotion as we realize that in 48 hours we will not rise to spend the day together as we have for the past week. Stay tuned for the next report, when we have all finished our duties here, and the experience of the last ten days comes into perspective. It was initially a concern for us that the concert hall was not available for dress rehearsal the day before the final concerts. 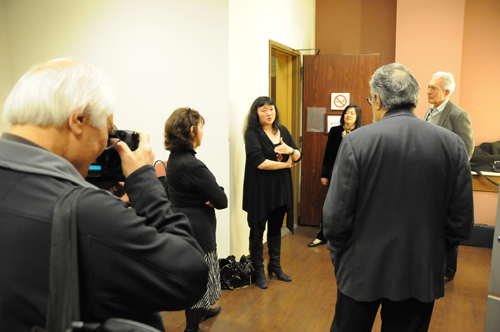 As it turned out, the run-throughs on Friday, with an extra day to address final issues, was an even better procedure. 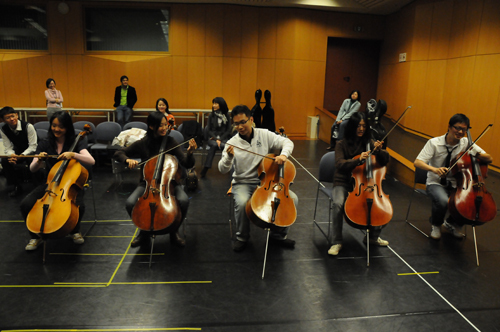 The students had the extra day to absorb the experience playing in a real hall instead of studios. Having spent the last week stopping and starting during coachings, they finally had their powers of concentration tested as they ran through their pieces uninterrupted. And most importantly, the faculty had the chance to hear the performances from a distance, and to take notes in preparation for a final day of touch-ups on Saturday. While a violinist nursed a bad cold, Ani Kavafian grabbed the opportunity to lead a passage from the Dvorak Quintet, pulling the group with her through the sheer force of her musical conviction. On Sunday morning, Wu Han and I took the groups through their final soundcheck, rehearsing movement beginnings and endings, and all the choreography of chamber music stage deportment. It’s not as simple as one might think, and it’s easy for inexperienced ensembles to look awkward and unsure without some guidelines. 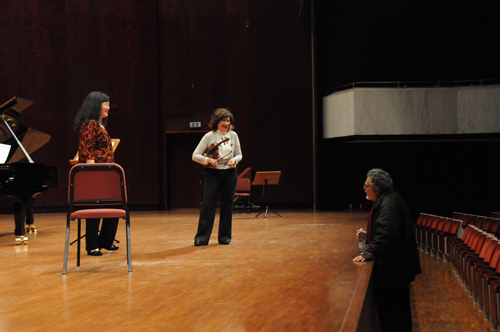 Wu Han and Madame Tchen welcomed the first of the day’s two audiences, explaining the genesis of the concert and the project itself, and introducing the faculty. 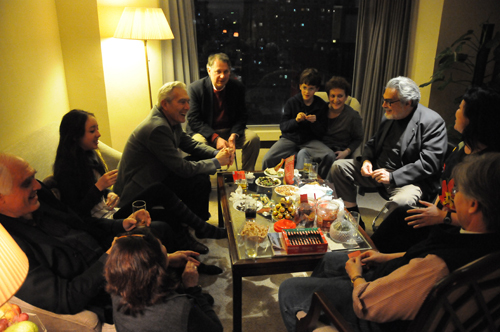 Adjourning to the hotel, we were only able to coax Arnold Steinhardt and Phil Setzer to our suite for a final happy-hour/faculty meeting. I admit not being the most gracious host, as, instead of simply allowing them to relax, I was unable to let go of our mission in Taiwan and tried to extract from them their thoughts for possible improvements for next year’s session, After a while they could endure no more and left to pack, while I sorted the notes I took, and my own thoughts, late into the night. The challenges of this project were multi-dimensional. First came the organizational might necessary to pull together individual students through auditions, and form them into ensembles, which was a co-effort between the National Concert Hall and us. The New York and Taiwan staffs then had the daunting task of scheduling, financial arrangements, visas, local and international travel and hotel arrangements. Finally falling to the National Concert Hall staff were the daily production challenges: meals, transportation, room assignments, piano tunings, video recording and photography, and more. In all these areas, we were fortunate that everything went smoothly and as planned, for which we owe an enormous debt of gratitude to all those who worked so hard to make it possible. The musical challenges, however, were far more complex. 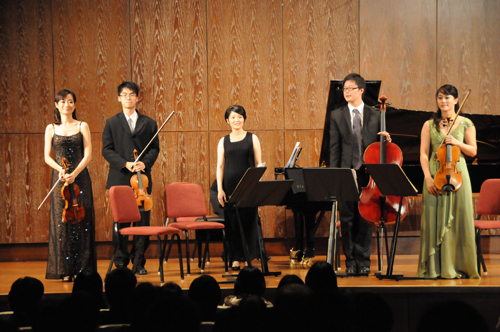 Chamber music is still a foreign language for many, many players. The role of the chamber musician entails duties that are seldom learned in the study of solo and orchestral literature. The degree of musical self-suffience must be extremely high: the knowledge of the score thorough; the ability to prepare one’s part as expertly as any solo work; the skill of playing and listening simultaneously highly developed; the abilities to lead, support and accompany on equal levels; and the capability of hearing oneself and the total ensemble’s work with accuracy and judging it with discrimination. Helping these young players develop all of those skills was the essence of our work over the past week. To our colleagues, Phil, Arnold, Ani, Ara and Leon, we cannot express our thanks enough. They taught with unflagging energy, enthusiasm and concern for the good of our students. They were respectful not only of each other but of the students, keeping open minds, engaging in fascinating exploratory dialogue, contributing extra time for individual work, and musing together to and from the Concert Hall, in faculty meetings, and at breakfast, lunch and dinner on ways to move groups and individuals ever further along. Plus, what we learned from them – from hearing their musical thoughts, from watching their methods, and hearing the results they got from the students – was worth its weight in gold to us. Ultimately, the responsibility for taking this project, and ones like it, to an even higher level of success, rests on our shoulders. Our obligation is to look back and wonder: what worked and what didn’t? What should be done differently next time? How can everyone, us included, be better prepared for the experience, in order to maximize the amount absorbed by the students in such a limited time? How can we be even surer that what the students learned this week will be of lasting value to them, that they will be able to continue to grow, using the musical tools we have given them? 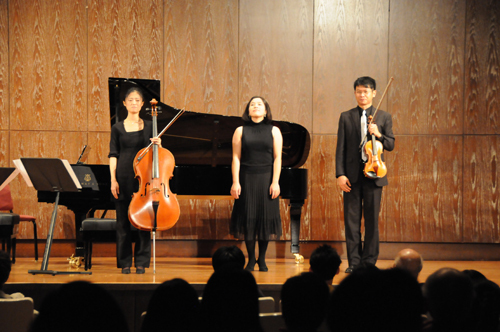 The proof of the value of our work rests not so much with the performances they gave on Sunday, but on their future chamber music performances, with different repertoire and different colleagues. 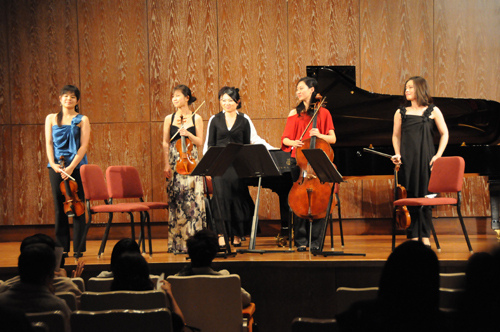 Have we achieved our project’s mission – to enable them to become their generation’s leaders of chamber music in Taiwan? Time will tell, and while we wait, we work. In the coming days I will post on our site ideas for better student preparation, gleaned from our faculty. 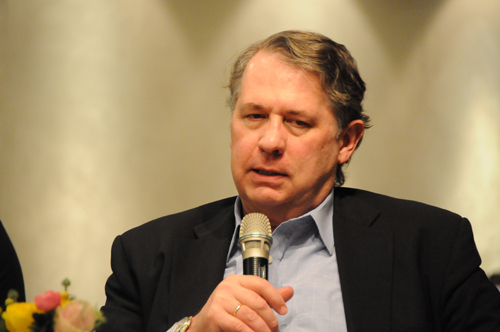 Hopefully it will lead to stronger starts, fewer surprises, and faster progress during our various ongoing workshops, in Menlo, Korea, and Taiwan. UPDATE 1/6/10: The letter containing suggestions for students can be found here. 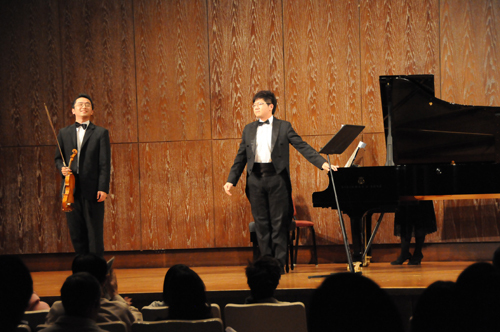 Since 2006, the first season at the Chamber Music Society fully programmed by David and Wu Han, the month of December has provided a multi-concert Baroque Festival for the enjoyment of listeners hungry for celebratory music during the holidays. 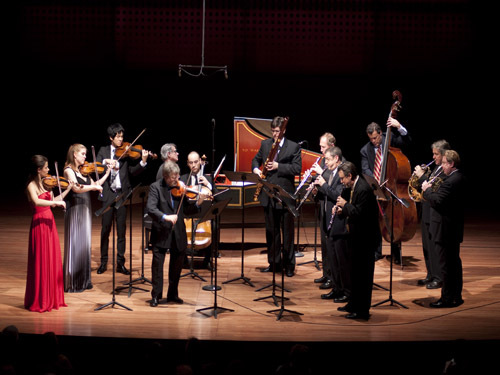 This year the festival offered not only the annual Baroque Collection program – an eclectic selection of baroque repertoire from across the geographic and stylistic spectrum – but also a stunning recorder program by the Danish virtuoso Michala Petri, and four performances of the Bach’s beloved Brandenburg Concertos. “Would they like to have more of it?” was the question we asked back in 2004, when we were told that since 1994, Alice Tully Hall has been sold out every season for two performances of the Brandenburg Concertos. A study of the Society’s first two decades revealed frequent and diverse baroque repertoire appearing throughout the season, and somehow over the years the amount of it had diminished to the point where practically the only baroque works being presented were the Brandenburgs. We decided to resurrect and re-imagine the early CMS tradition of baroque performance by creating the first Baroque Festival in the 2006-07 season, to see if the interest in music of the baroque was actually wider than just the Brandenburgs. Sure enough, it was. 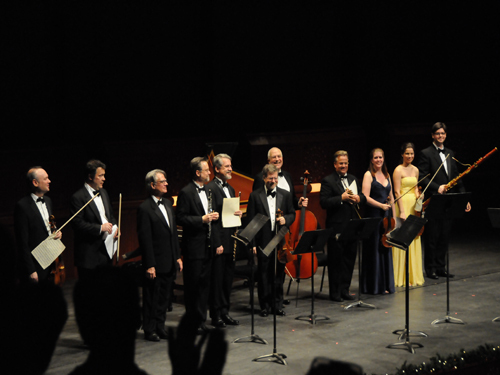 The first Baroque Festival sold out and has continued to do so ever since. The festival is now something we can truly call annual (as we called it on faith the first year!) and there seems to be no end to the programming possibilities, or to the audience’s curiosity. After the pair of Collection concerts on December 4th and 6th, which featured music of Biber, Vivaldi, and many others, we were stunned, along with everyone else, by the much-anticipated debut at CMS of Michala Petri on December 8th. The world’s reigning virtuoso of the recorder performed, flawlessly, a 2+ hour program of some of the most dazzling repertoire we’ve ever heard. Backed by her husband, archlutenist Lars Hannibal, and a small band of CMS musicians, she played recorders of all sizes in music of Bach, Telemann, Vivaldi, Sammartini and others, which brought the sold-out crowd to its feet, demanding encores. 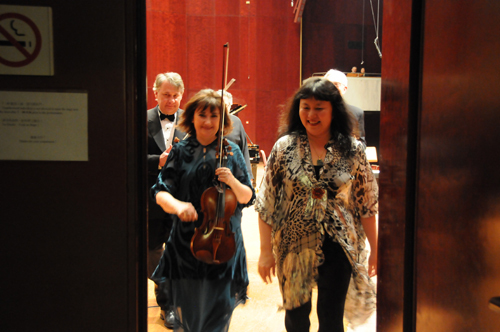 In the wings, I greeted violinist Cho-Liang Lin as he came off stage with a stunned look: “I really don’t understand how she does it” said the equally gifted virtuoso of his instrument. 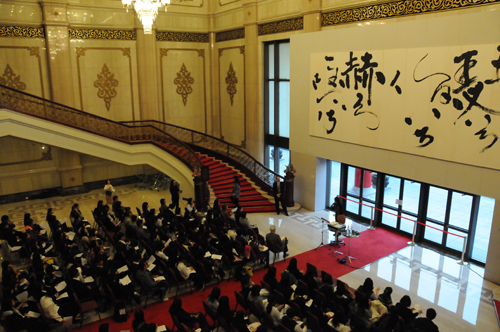 After the concert, Wu Han made a flowery and diplomatic bi-lingual speech in the Hauser Pavilion to a large delegation from the Taiwan embassy which had attended the concert. 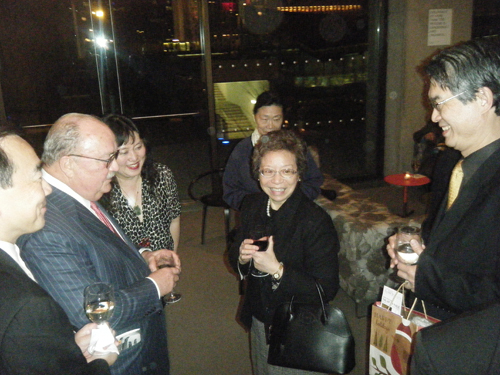 She introduced CMS Board Chair Peter Frelinghuysen to the dignitaries, who were more than thrilled to see the Taiwan-born Wu Han at the helm of the ship, especially in the Society’s truly glamorous new venue. The Society’s fall season was brought to a rousing close with four performances of the incomparable Brandenburg Concertos. 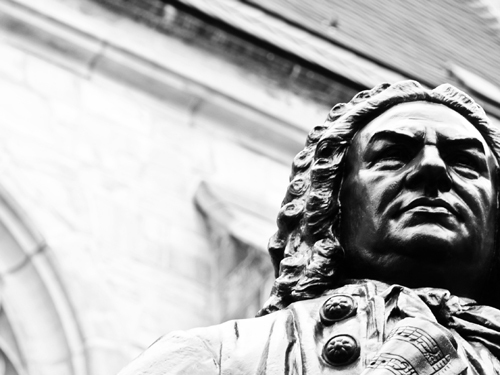 Composed between 1710 and 1721, Bach assembled them into a set and sent them, with a duly-obsequious dedication, to the Margrave of Brandenburg, in hope of a position of employment. (It can turn one’s stomach to read how someone of Bach’s stature had to grovel in front of royalty in those days.) The Margrave didn’t have the orchestra, nor apparently the intelligence, to realize even one performance of the works, never answered Bach, and put the works in a drawer until they were sold after his death in 1736, for today’s equivalent of $22. What can you say besides “what an idiot!”, or “talk about a missed opportunity!” We can be endlessly thankful that they were not lost, as they have given the world incalculable enjoyment. 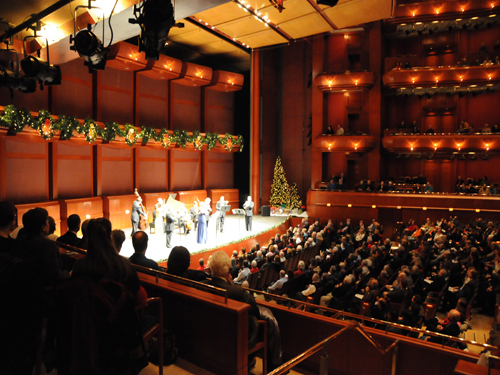 Friday the 11th saw the Society’s initial Brandenburg concert at the New Jersey Performing Arts Center, or NJPAC, a glorious venue right across the Hudson River in Newark, NJ. 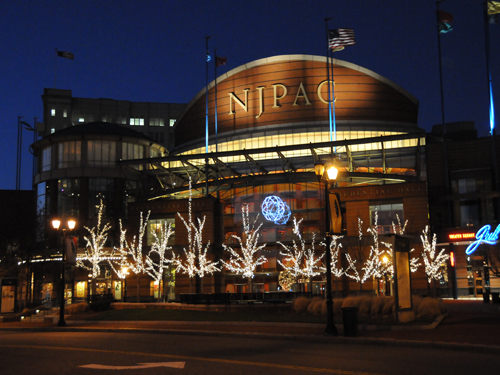 Over 1500 people turned out on a freezing night for a stunningly successful first-ever NJPAC performance by CMS. Decorated festively for the holidays, the hall was warm and welcoming, the enormous crowd loudly appreciative, and I doubt it will be long before we return. As we’ve seen in New York, this music is addictive. Sunday the 13th was a day eagerly waited for, on which we would hear the Brandenburgs in the vibrant acoustics of our newly-renovated Alice Tully Hall. Our expectations were not disappointed: the winds rang clear as bells; the details of harpsichordist John Gibbons’ realizations were beautifully audible; the sonorous bass of Edgar Meyer provided a firm cushion for all; and the golden trumpet of now-five-year Brandenburg veteran David Washburn soared throughout the hall in a blaze of impossibly-high notes that drove the crowd to a frenzy. I do believe that the heightened reaction of the historically reserved CMS audience lately has been due to the fact that in these new acoustics they are simply receiving more music: more volume, more color, more detail, more passion, and they are responding in kind. 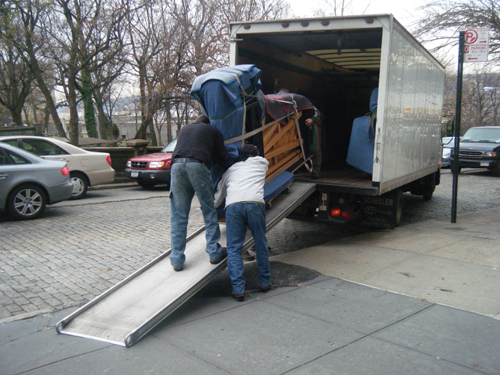 The next day, Monday the 13th, we boarded vans for the drive to Princeton, New Jersey, for a return appearance on the McCarter Theater series. 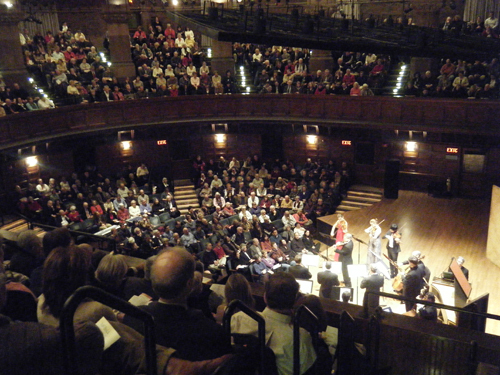 Playing to a full house in the University’s Richardson Auditorium is always a pleasure. 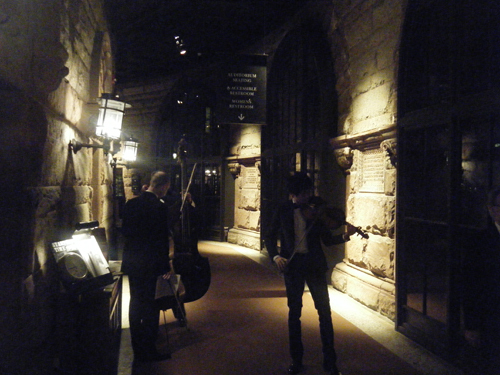 The hall’s gracious curves provide a sensation of intimacy for a large number of listeners, and the pristine quiet is in part achieved by the fact that this is a hall-within-a-hall, with corridors surrounding the performance space, enclosed by massive stone walls. The final CMS performance of the fall season took place the following night, Tuesday the 14th, once again in Tully and once again for a completely sold-out hall. As exhausting as these performances had been, there was a palpable sense of sadness amongst us as we finished and said our goodbyes and best wishes for the holidays. “Couldn’t we get together again tomorrow, somewhere?” said cellist Fred Sherry, only half-joking. Off went our amazing new CMS Two cellist Jakob Koranyi, to Frankfurt; CMS founding flutist Paula Robison to Boston; trumpeter David Washburn to Los Angeles; horn player Bill VerMuelen to Houston; and me and Wu Han, after only two hours of sleep, to Taipei, for the next incredible musical adventure in our wonderful lives. Many cello-related questions have come in lately, so I’ll answer a selection of them – to the best of my ability – here in a single video. During the final moments of preparation for ArtistLed’s January 12th release, David and Wu Han disappeared for two days into the American Academy of Arts and Letters to record yet another CD, ArtistLed’s 13th. Stay tuned. 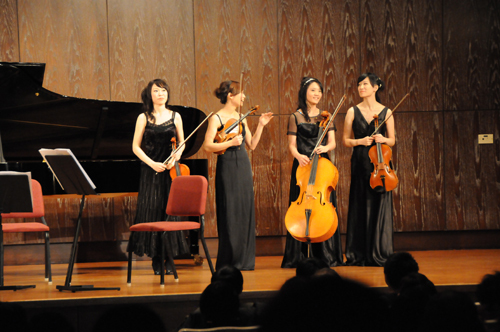 Beginning with four consecutive concerts in Spain, during which the quartet was joined by pianist Emanuel Ax for the quintet by Dvorak, the Emerson Quartet fall Europe tour was rounded out by performances in Turin, Naples and Rome, with a stop in London for two concerts at Wigmore Hall. 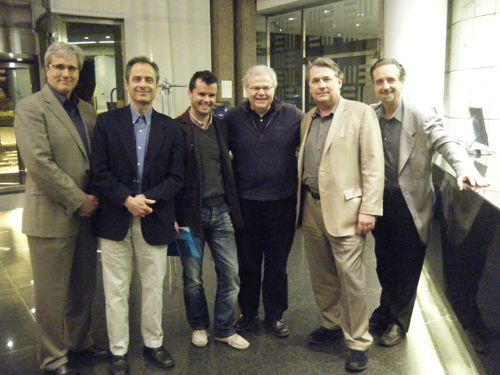 In addition to the quintet repertoire, the Emerson performed quartets by Janacek, Beethoven, Schubert and Haydn. 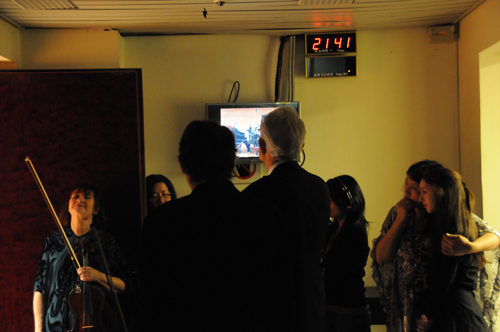 Our arrival in Valencia was greeted with an inspired performance the same night of Haydn’s oratorio “The Seasons” by the Monteverdi Choir and the Orchestre Révolutionnaire et Romantique, led by their founder and director, John Eliot Gardiner. 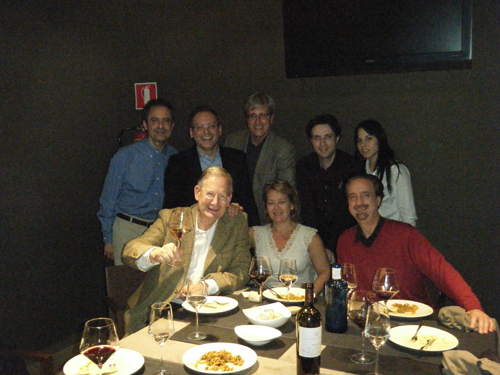 At dinner after the concert we were joined by John Eliot, his wife Isabella, and CMS Two clarinetist and Valencia native Jose Franch-Ballester and friend Christina. Our program for the tour consisted of the ESQ appearing first in a string quartet – either our early Schubert Eb or the Beethoven Op. 74 “Harp”, then Manny in a Beethoven’s Piano Sonata Op. 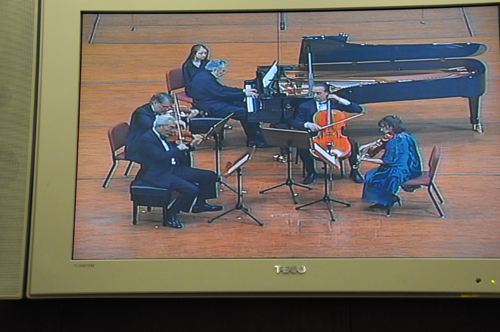 2 #3, followed by the Dvorak Quintet and an encore of the scherzo from the Schumann Quintet. 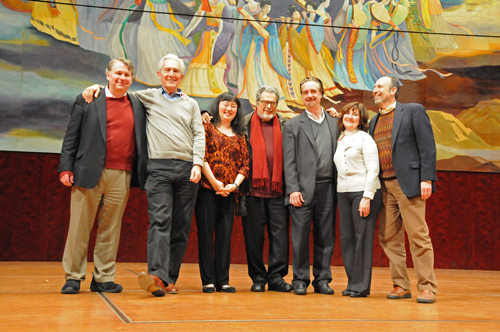 Following the first performance in Bilbao, we boarded flights for Madrid and then on to Oviedo in the north for the second concert that night. Manny was the most supportive and helpful touring companion one could imagine. 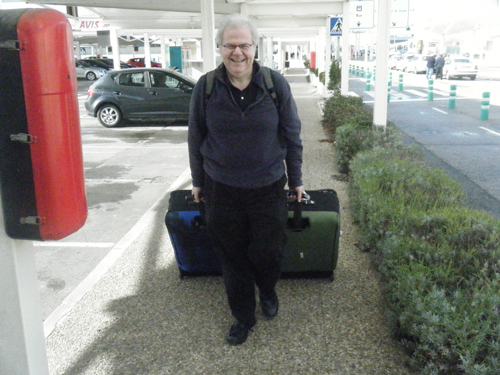 He not only happily put up with quartet travel hardships, like sitting in the back of a car underneath my cello, but also insisted on dragging my suitcase for me – when I couldn’t get to it before he grabbed it. The next night after Valencia we were in the northern coast of Oviedo, in the Asturias region, to perform in the city center’s Principe Felipe Auditorio. 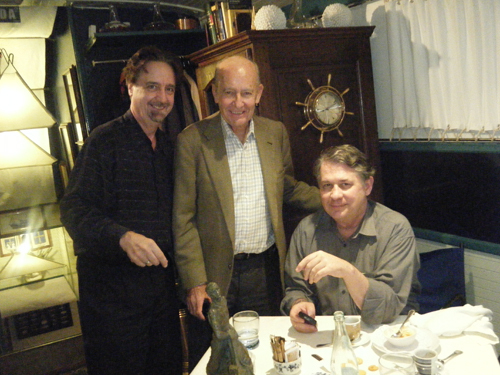 We were delightedly surprised at lunch by the appearance of our great friend, the distinguished Mexican musician Juan Luis Prieto, who was accompanying his brother Carlos on a book promotion tour. Carlos is the owner of one of the most famous cellos of all time, the Piatti Strad, and his book about the history of the cello, Adventures of a Cello, is an amazing read. 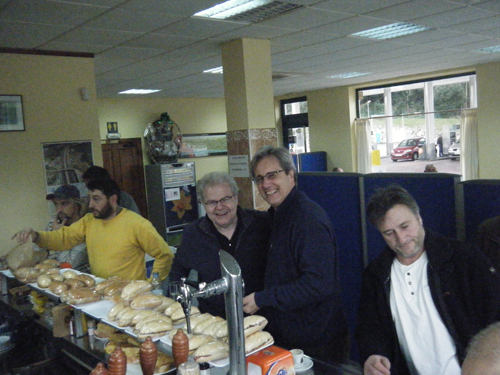 The drive of several hours east to Bilbao, the largest city of the Basque region, provided a nice opportunity to sample the delicious food of the Spanish highway rest stops – each has the feel of a family-run restaurant. 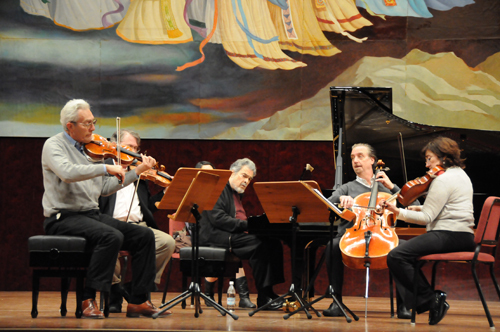 The concert in Bilbao was played for the historic Sociedad Filarmónica, an organization which was founded in 1896 and has hosted a comprehensive list of the world’s most distinguished musicians, as the historic backstage gallery attests. 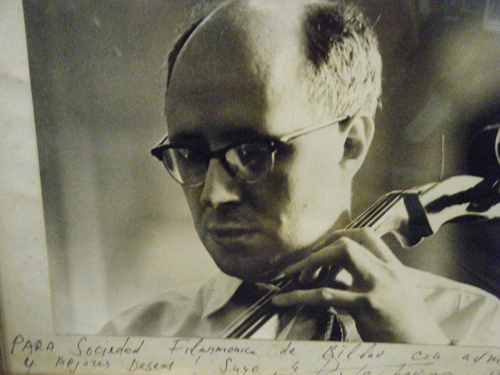 The photos include many musicians in their youngest performing years, including Rostropovich. 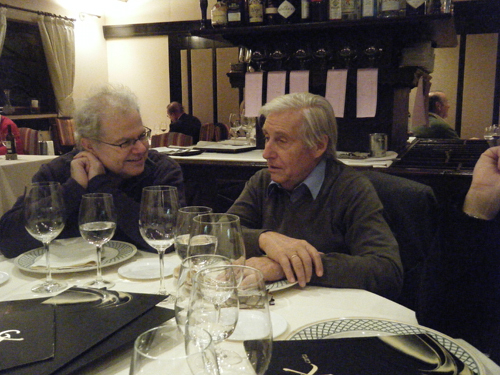 After the concert Manny was joined at dinner by the distinguished Spanish pianist Joaquín Achúcarro, a musician who recently celebrated his 60th anniversary on the concert stage. 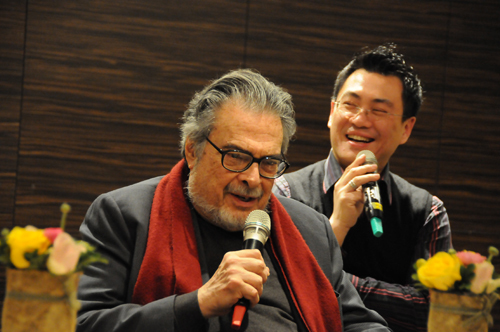 Having performed in 59 countries with 206 orchestras (see his website, achucarro.com), he and Manny had a lot of notes to compare. The city of Pamplona, in the region slightly to the south known as the Navarre, and home of the famous bull runs every July in the San Fermín festival, was the final stop on the Emerson-Ax portion of our tour. 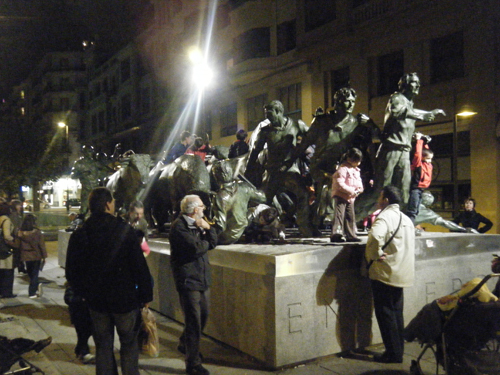 A sculpture near the concert hall captured the craziness of the event. 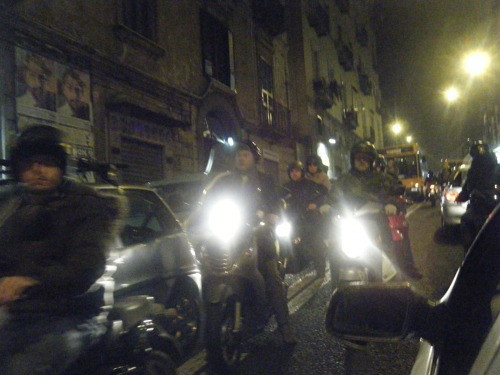 We bid Manny a fond farewell on the street, after a grand meal that lasted late into the night. 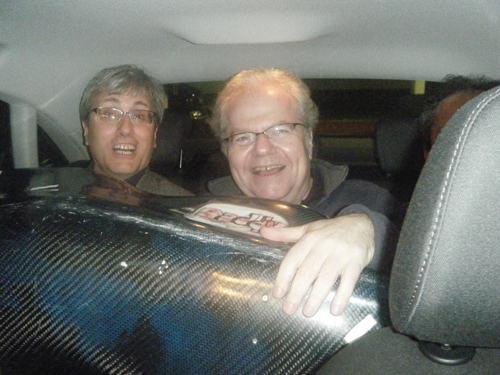 Manny journeyed by car the next day to a recital in the Spanish city of Valladolid, where we have played many times, and a return to Valencia for another solo recital. Our next stop, in London, brought us to one of our favorite venues – Wigmore Hall – for two concerts: one on the Monday afternoon BBC3 live (the Haydn 7 Last Words) and a full recital the following evening. 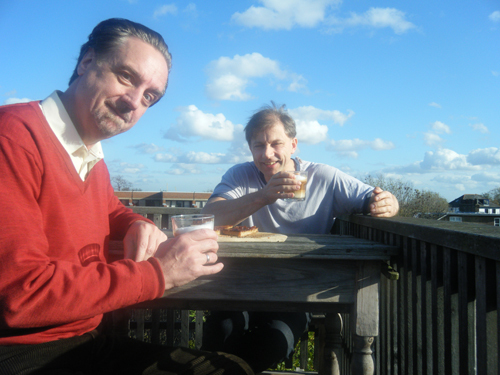 During the visit, I found time to visit our good friend Simon McBurney, actor and theater director, whose company, Complicite, partnered with the Emerson Quartet in The Noise of Time. 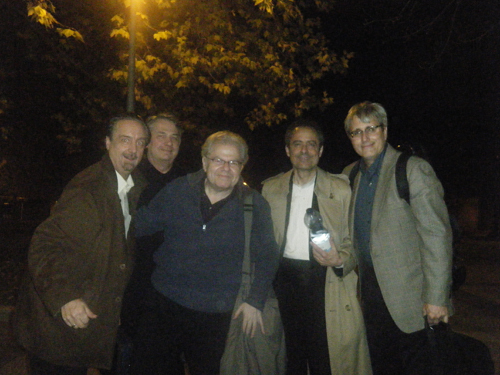 The following day took us to our favorite Italian city of Torino, where we appeared again for our friend Giorgio Pugliaro and his organization Unione Musicale. 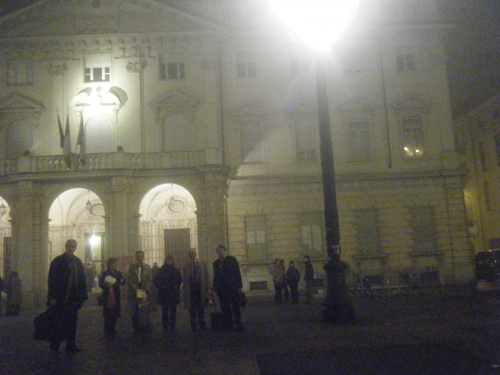 The venue is the magnificent hall of the Conservatorio G. Verdi, which was shrouded in a mysterious Italian fog when we emerged late (concerts regularly begin at 9pm in Italy), and headed for an exquisite dinner. 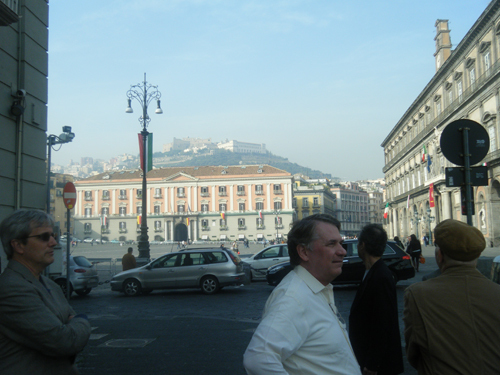 Flying to Naples the next day, we were greeted by a brilliant sun, which shone on our mountaintop venue for the evening, the Castel Sant’Elmo, completed in 1343. After the concert, and harrowing cab rides through the Quartiere Spagnolo, we were graciously invited for a sumptuous dinner at the home of Associazione Alessandro Scarlatti president Lucio Sicca. The Association is celebrating its 90th anniversary this season, and has hosted many of the last century’s most famous musicians. 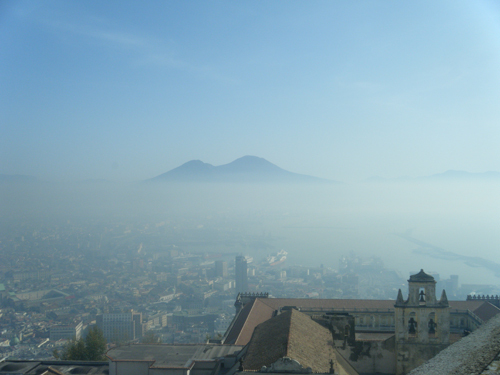 The following day, a return visit to the castle offered a stunning view of the city and Mt. Vesuvius, at an all-too-close distance. 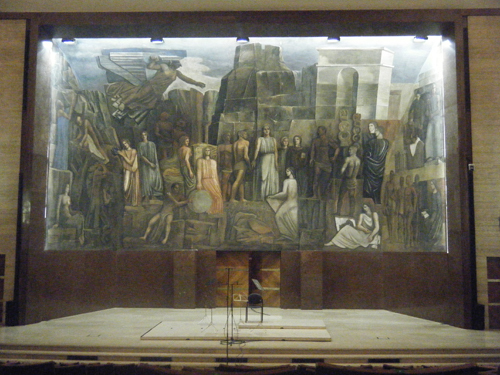 The final stop on our tour was Rome, where we performed for the first time on the series at the University’s Auditorio L’Aula Magna, decorated with a stunning mural, the artist or significance of which I was not able to learn. 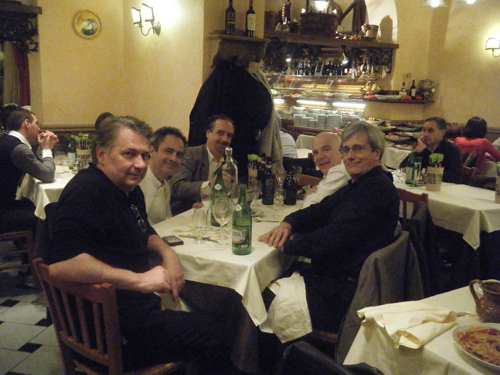 At the final dinner of the tour we joined by the quartet’s longtime friend Harold Slapin, who made the journey from New Jersey to visit the quartet in Italy and to spend a couple of extra days sightseeing with me as tour guide.